It wasn’t long ago that the major carriers did everything they could to keep users away from prepaid services. Whether it was pulling a slower data connection or cutting services that they toss in for free to their post-paid subscribers, the big boys didn’t want you to touch their prepaid plans with a 10 foot pole. That has all but changed with the dissolution of service contracts and the emergence of the sub $100 smartphone. Verizon Wireless is definitely leading the way in providing their users with a stellar prepaid experience, and it all starts here. Starting off with the devices, you have phones like the Motorola Moto e4 available for under $100, and we mean way under $100. The $69.99 price tag will cost users under $75 after taxes in most locations. Paired with the $40 3GB plan, the yearly cost comes in well under $600 and the two year cost barely clears the $1000 mark. Yes, Verizon Wireless prepaid service is such a deal that the cost of 2 years of service and a great starter device will cost you about the same as a flagship design device alone. Of course, don’t think going with Verizon Prepaid means that you have to compromise your handset or deal with inferior products to save a few bucks. 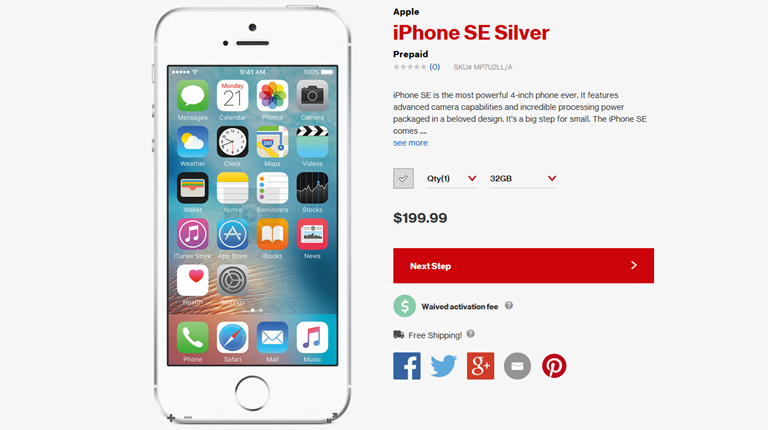 With devices like the iPhone SE for $199.99 or the $576 Samsung Galaxy S7, you don’t need to settle for less performance on Verizon’s Prepaid plans. 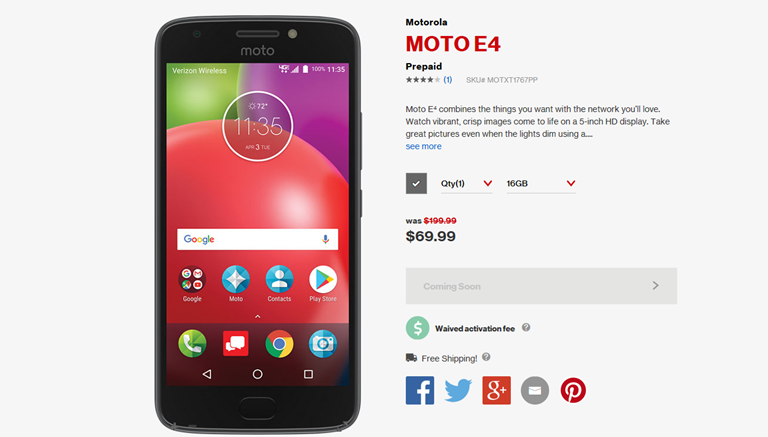 An even better deal for users that want to head to the prepaid side is to hit up Motorola for their $229 Moto G5 Plus. You simply purchase a Verizon Prepaid Starter Kit to get your G5 activated and end up with a top notch smartphone on a stellar network for under $300. With the phone options ranging from ultra-affordable to full flagship power, the only step to consider before you move to Verizon’s Prepaid offerings is how much high speed data you need to get through the month and how much you can save. The $30 plan offers unlimited talk and text without any data being included. This is the perfect plan for those that are always around Wi-Fi. The $40 offering moves users up to an unlimited talk, text and data plan, with the first 3GB coming down at LTE speeds. The $40 plan also includes the ability to use your device as a hotspot, unlimited texting to over 200 international destinations and Verizon’s carryover data feature. This feature allows you to store LTE data for an extra month if you don’t use it. If this sounds complex, don’t worry, it’s pretty simple. You are given 3GB of LTE data each month. If you happen to use 1.5 GB this month, you will have 1.5 GB that carry over to next month, giving you 4.5 GB of high speed for that billing cycle. Now this does get a bit funny when the data expires at the end of the month. Remember you use your primary data first, so if you use up 4 GB, you won’t get the .5 GB carried over again, it just goes away and you start the next month again at 3GB. If you just use 1.5 GB again, you will carryover the 1.5 GB left from your primary plan again for the following month, giving you 4.5 GB total. If you are thinking that 3 GB isn’t enough data for you, you can upgrade to the 7GB plan for $50, the 10GB for $60 or even the full unlimited LTE plan for $80. 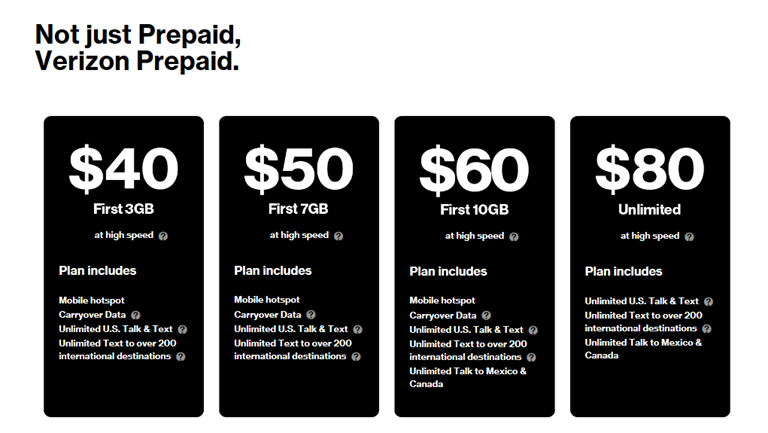 To make the 10GB and Unlimited plans an even stronger value, Verizon is including unlimited talk and text to Canada and Mexico with them. With the price of the 10GB and Unlimited plans, you may not experience too much in the way of savings, but it is a great alternative to paying more for a lesser network. Verizon has worked very hard to see what plans will fit users best. From the $30 phone and text only to the fully unlimited plan that comes in at $80, Verizon has a prepaid option that will fit just about any user’s needs. If you want to take advantage of the savings that prepaid will offer you while staying on the best network in most areas, click the link to find out more. Next Post Remembering U: Whatever Happened To HTC 2017 Phones?